#VazhaipooParuppuUrundaiKuzhambu #BananablossomLentilBallsGravy : I recently prepared paruppu urundai kuzhambu using banana flower [ banana blossom ]. 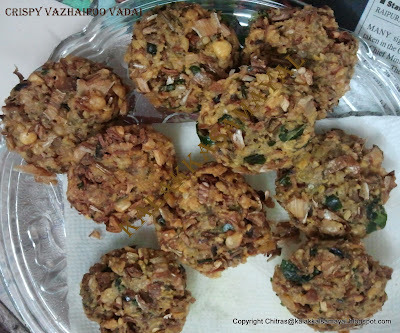 The taste was very good and here I am sharing the recipe with you all. Remove center stem from each floret of vazhaipoo [ banana blossom ]. Wash and Soak gram dhal, boiled rice and black gram in water for an hour. Then drain water and take soaked lentils, green chilly, cumin seeds and salt in a blender. Grind coarsely without adding water and transfer into a bowl. Add turmeric powder and chopped vazhaipoo [ banana blossom ]. Roll into a small small balls. Heat a kadai with oil on a stove over medium flame. Crackle mustard seeds and then add asafoetida. Now add green chilly, curry leaves and quatered small onions. Then add chopped tomato and saute till it becomes soft. Now add coriander powder, turmeric powder, salt, Sambar Powder and Araithuvitta Kuzhambu Powder. Mix well and add a cup of water and bring it to a boil. Add lentil balls gently once the mixture starts boiling. Don't disturb the balls for 5 minutes. Make sure that the balls completely get immersed in the liquid. Squeeze out pulp from soaked tamarind with half a cup of water and strain into boiling kuzhambu. Allow to simmer for 5 to 10 minutes. Check whether the lentil balls get cooked. Add chopped curry leaves and coriander leaves. Take hot white rice in a plate, pour a ladle full of sambar, add a dash of ghee and mix well with hand.